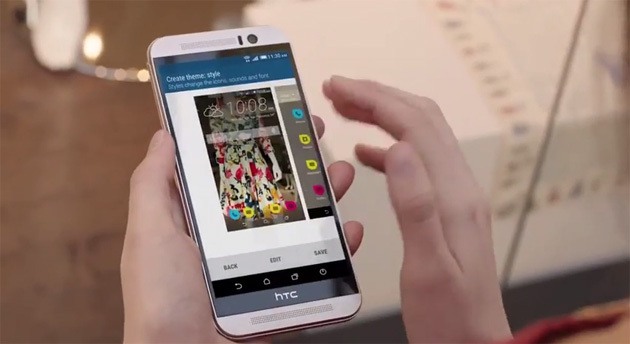 HTC’s newest flagship smartphone, the One M9, sports a Themes app to help users manage the font, sounds, colors, wallpapers and icons on the phone. This is one of the key features the company has demonstrated on stage during the HTC Mobile World Congress event when M9 was officially introduced. This app will make it possible for you to change the entire look and feel of your One in a simpler way. Read on to get started with Themes on your phone. For owners who might have issues with their phone, feel free to contact us at [email protected] and provide all necessary details so we can help you solve them. You may also visit our HTC One M9 Troubleshooting page. Tap the All Apps icon from the Home screen. Tap the Themes app icon to open it. Sign in with any of your account. When prompted with the Recommended screen, swipe right or left under each category and start browsing for recommended themes. Swipe left and tap See all to view all available items for a specific category. To view details of an item, tap an item. A new screen containing more details of the selected item will then appear. Tap Download to start downloading the theme you desire. Once it’s finished downloading, tap Apply to apply the theme. Hint: All of your ringtones and alert tones will change if your theme contains custom sounds. Start browsing categories to find something you like. When you found the item you desire, tap it. Tap the Bookmarks themes icon and you will find the selected them in bookmarked in My Themes. All themes you created, bookmarked, or downloaded are saved in your theme collection. To view them, open the Themes app, tap the icon to choose gallery view, and then select My Themes. Tap the All Apps icon from Home. Tap the Add (+) icon to continue. Select Choose Home image. Doing so will let you set the main wallpaper for your theme. When prompted, crop the image, and then tap Done when finished. Select a pre-defined style you want for your theme by swiping up or down to a style you want. To save your theme, tap Next. That is if you no longer want to customize your theme. Otherwise, tap Edit and proceed to step 9. Tap any of the categories you want to customize, manage, and experiment with the settings according to your preference. To view how your theme will look like, tap Preview. Once everything is done, tap Finish. Name your theme and tap OK to save it. Hint: Be sure to select the option to Apply this theme now if you want the theme to be applied right away. Tap the icon to choose gallery view. Make necessary changes you want for the theme, and tap Save to update your current theme. Open the Themes app by tapping the All Apps icon from Home. Search the theme you want to share, and tap it to view details. Tap the Share icon while viewing the details page of the theme in the catalog, to share it. Swipe to the My collection tab. Tap to select the theme(s) you want to remove from your collection. If the theme you deleted is currently applied to or used in your device, just select and apply another theme to have the completely deleted. For more inquiries, specific tutorial requests, and HTC One M9 issues to address, feel free to drop us an email at [email protected]. We will be glad to assist you further. You may also visit our Facebook page to keep track of our latest posts and website updates through the newsfeeds.